Background: Uterine enlargement and associated increase in its vascularity during pregnancy are believed to increase the risk of haemorrhage and thus caesarean myomectomy is often avoided. However, some reports have claimed that caesarean myomectomy is safe during caesarean section. Aim: This study aims to compare blood loss during caesarean myomectomy and caesarean section with a view to determine the safety of carrying out a caesarean myomectomy. Methods: A retrospective review of all parturient that had caesarean myomectomy (study group) or caesarean section (control group) in a Cottage Hospital in the Niger Delta from September 2011 to August 2012 was carried out. The patients with incomplete data, those with previous abdominal surgery and placental disease and emergency caesarean section were excluded from the study. Data were collated on intraoperative blood loss, intraoperative blood transfusion and packed cell volume (PCV) change. Data were analysed using the SPSS version 16.0 software. Results: There was no statistical difference in the mean age of the parturient in the study (31.3 ± 3.9 years) and control (30.9 ± 3.4 years; P = 0.72) groups. The mean estimated blood loss between the study group (670.8 ± 227.9 ml) and control group (575.0 ± 226.5 ml) was not statistically significant (P = 0.15). 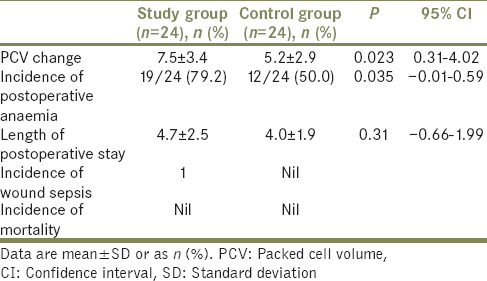 However, the PCV change between the study group (7.5% ±3.4%) and control group (5.2% ±2.9%) was statistically significant (P = 0.002), with a higher incidence of post-operative anaemia observed in the study group (P = 0.035). Conclusion: Caesarean myomectomy significantly increases the risk of intraoperative blood loss which can easily be underestimated, resulting in undertransfusion and anaemia with its associated complications. Caesarean myomectomy should, therefore, be carried out when benefits outweigh the risk and appropriate precaution should be put in place to manage possible intra- and post-operative anaemia. Leiomyoma has been reported in 2% of pregnant women., During pregnancy, there is increase in the size and vascularity of the uterus making many obstetricians to avoid myomectomy during caesarean section. There are reports of haemorrhage indicating hysterectomy by some authors, while others reported that caesarean myomectomy has no significant increase in blood loss and has been advocated in selected cases especially when the myoma is situated in the line of incision. This retrospective study aims to compare blood loss during caesarean myomectomy and caesarean section with a view to determine the safety of carrying out a caesarean myomectomy. This was a retrospective study carried out between September 2011 and August 2012. The study group comprised mothers with coexisting myomas who underwent caesarean operation for which myomectomy were also carried out. The control group consisted of the parturient without fibroids that had only caesarean section after each case of caesarean myomectomy. The patients with incomplete data, those with previous abdominal surgery and placental disease and emergency caesarean section were excluded from the study. Other criteria for exclusion in both study groups included parturient with multiple gestation, pre-eclampsia or hypertension in pregnancy, bleeding disorders, diabetes mellitus, febrile illness, age <18 years and those in which spinal anaesthesia was contraindicated. Informed consent was obtained for the procedure by both the attending gynaecologist and the anaesthetist. Two units of blood were grouped and cross matched for each of the patients in both the study and control groups. All the procedures were carried out under spinal anaesthesia. The myomectomies were done by the same surgeon after delivery of the babies and commencement of oxytocin infusion. The uterine incision made to enucleate the fibroid was sutured first before the next incision. Blood loss was measured by visual estimation of soaked gauze and drapes and the volume of blood in the suction bottle. Data were collated on age of the parturient, intraoperative blood loss, incidence of intraoperative blood transfusion, packed cell volume (PCV) change, incidence of post-operative anaemia and length of hospital stay, incidence of caesarean hysterectomy and mortality. Anaemia was defined as PCV <30%. Data were entered into a spread sheet and analysed using the Statistical Package for Social Sciences (SPSS) 16.0 for Windows (SPSS Inc, Chicago, IL, USA) and Winpepi version 9.7 (Abramson JH, School of Public Health and Community Medicine, Hebrew University, Jerusalem, Israel). Results are expressed as mean ± standard deviation and number of patients (%). The confidence interval was set at 95%. P < 0.05 was considered statistically significant. A total of 24 patients were studied in each group. [Table 1] shows the age and intraoperative data. The mean age of the parturient in the study group was 31.3 ± 3.9 years and 30.9 ± 3.4 years in the control group (P = 0.72). The mean blood loss in the study group was 670.8 ± 227.9 ml and in the control group was 575.0 ± 226.5 ml (P = 0.15). Out of the 24 parturient in the study group, 2 (8.3%) were transfused intraoperatively while none (0.0%) was transfused in the control group (P = 0.14). No incidence of uncontrolled haemorrhage leading to caesarean hysterectomy was recorded in both groups. The mean number of fibroids extracted from the study group was 3.88 ± 4.79: the number of fibroids extracted, ranged from 1 to 7 in 22 of the parturient while the remaining two parturients had 10 and 23 fibroids extracted from them, respectively. 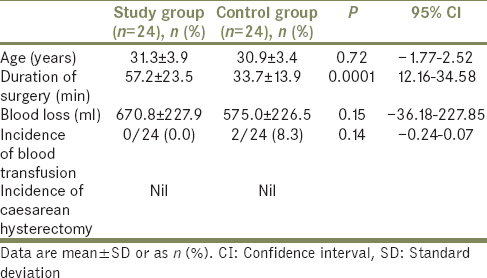 The post operative data presented in [Table 2] shows that the mean PCV change was 7.5% ± 3.4% and 5.2% ± 2.9% in the study and control groups respectively, (P = 0.023). The incidence of post-operative anaemia in the study group was 19 (79.1%) and 12 (50.0%) in the control group (P = 0.035). The average length of post-operative stay in the hospital was 4.7 ± 2.5 and 4.0 ± 1.9 (P = 0.31) for the study and control groups, respectively. The estimated incidence of fibroid in pregnancy is 1%–4%, and patients previously diagnosed of having myomas frequently request for removal during caesarean section. Caesarean myomectomy is usually discouraged because the size and blood supply of myomas increase in pregnancy, with a theoretical risk of excessive haemorrhage. Haemorrhage is the most common cause of the direct maternal death. Classical caesarean operations and bilateral tubal ligation for myomas situated in the lower segment were preferred, and this option automatically terminates the patient's obstetric career. The increasing popularity in organ preservation without loss of function stimulated the interest in myomectomy during cesarean section. Exacoustòs and Rosati reported haemorrhage indicating hysterectomy in three of the nine caesarean myomectomies they carried out, and Hsieh et al. also reported three hysterectomies out of ten cases. However, Ehigiegba et al. advocated caesarean myomectomy in selected cases, especially when myoma is situated in the line of incision. Ehigiegba et al. in their own study reported no haemorrhage that indicated hysterectomy in the 25 cases that had caesarean myomectomy, and therefore concluded that experience and use of high-dose oxytocin infusion in the intra and post-operative period reduces haemorrhage that may complicate the procedure. In a similar study by Kumar et al., there was also no significant haemorrhage that indicated caesarean hysterectomy The uterus in the post-partum phase is better adapted to control haemorrhage. The contraction of uterine muscle fibres which is further enhanced by oxytocic closes the blood vessels and increase in coagulability during pregnancy also aids clot formation. Spinal anaesthesia eliminates the use of inhalational anaesthetic agents and the effect it may have on the tonicity of the uterus, thereby contributing to a reduction in intraoperative blood loss. However, the average blood loss during caesarean section as estimated by anaesthetists in a study by Khan et al. was found to be 498 ± 176 ml. Dimitrov et al. observed a 10% increase in blood loss during caesarean myomectomy, while Hsieh et al. reported that caesarean myomectomy adds only 112 ml to intraoperative blood loss. Gbadebo et al. reported an average blood loss during Caesarean myomectomy to be 806.8 ml while in a similar study by Ehigiegba et al. and Owolabi et al., the averages were 876 ± 313 ml and 589 ml, respectively. An average blood loss of 670.8 ml as was observed in this study, therefore, falls within the range previously documented. Large uterine fibroids and multiple uterine incisions for myomectomy are risk factors for haemorrhage. Estimation of blood loss during caesarean section is difficult because of dispersion of blood and the mixture of blood with amniotic fluid, dilutional effect of crystalloids and intercompartmental fluid shift Underestimation of blood loss leads to under transfusion and complications associated with anaemia such as hypotension, tachycardia and tissue hypoxia while overestimation results in needless blood transfusion. Visual estimation of intraoperative blood loss is inaccurate.,,, The accuracy of visual estimation of blood loss is not related to level of training or years of experience. Estimation of blood in containers is more accurate than blood on gauze, abdominal mops and linens. However, contribution by amniotic fluid can result in overestimation of blood loss. The actual blood loss can be estimated using the patient's body weight, difference in pre and post-operative haematocrit and mean haematocrit. During acute blood loss, both red cells and plasma are affected, and there is no observed change on the blood indices, and it takes a minimum of 24 h for complete compensation to occur. This may be further compounded by haemodilution from intraoperative fluid administration. PCV change is therefore an unreliable measure of intraoperative blood loss. However, change in PCV after compensation is completed is a reliable indicator of blood loss as was the case in this study. Whereas the blood loss from visual estimation was not statistically significant, the PCV change was found to be statistically significant in the study group, with a higher incidence of post-operative anaemia recorded. Kumar et al. defined haemorrhage as decrease in haemoglobin (Hb) by 3 g/dl or more During pregnancy, there is increase in blood volume and red cell mass and parturient is, therefore, able to tolerate some degree of blood loss. The decision to transfuse perioperatively depends on the clinical assessment of the patient, although it has been documented that Hb of 7–9 g/dl is sufficient in critically ill patients. Post-operative anaemia (PCV <30%) was up to 79.1% in this present study; however, Ehigiegba et al. reported an incidence of 60%. With respect to blood transfusion, there was no statistical difference between the study and control groups in this current study. This finding is similar to that of Brown et al., who in a retrospective case–controlled study did not also observe any significant difference in the need for blood transfusion between caesarean section and caesarean myomectomy. Caesarean myomectomy is associated with significant increase in the blood loss which may not be revealed by visual estimation of intraoperative blood loss. However, there is no significant increase in the need for blood transfusion during caesarean myomectomy over caesarean section and may be safe if carried out by an experienced surgeon after good patient selection and a plan for managing possible haemorrhage has been put in place. A standardised method of estimating intraoperative blood loss with reasonable accuracy should be ensured in all health institutions. Rice JP, Kay HH, Mahony BS. The clinical significance of uterine leiomyomas in pregnancy. Am J Obstet Gynecol 1989;160:1212-6. Exacoustòs C, Rosati P. Ultrasound diagnosis of uterine myomas and complications in pregnancy. Obstet Gynecol 1993;82:97-101. Katz VL, Dotters DJ, Droegemeuller W. Complications of uterine leiomyomas in pregnancy. Obstet Gynecol 1989;73:593-6. Hasan F, Arumugam K, Sivanesaratnam V. Uterine leiomyomata in pregnancy. Int J Gynaecol Obstet 1991;34:45-8. Ehigiegba AE, Ande AB, Ojobo SI. Myomectomy during cesarean section. Int J Gynecol Obstet 2001;75:21-5. Agarwa K. Caeserean myomectomy. South Asian Fed Obstet Gynecl 2010;2:183-5. Kumar RR, Patil M, Sa S. The utility of caesarean myomectomy as a safe procedure: A retrospective analysis of 21 cases with review of literature. J Clin Diagn Res 2014;8:OC05-8. Khan FA, Khan M, Ali A, Chohan U. Estimation of blood loss during caesarean section: An audit. J Pak Med Assoc 2006;56:572-5. Dimitrov A, Nikolov A, Stamenov G. Myomectomy during cesarean section. Akush Ginekol (Sofiia) 1999;38:7-9. Hsieh TT, Cheng BJ, Liou JD, Chiu TH. Incidental myomectomy in cesarean section. Changgeng Yi Xue Za Zhi 1989;12:13-20. Gbadebo AA, Charles AA, Austin O. Myomectomy at caesarean section: Descriptive study of clinical outcome in a tropical setting. J Ayub Med Coll Abbottabad 2009;21:7-9. Owolabi AT, Kuti O, Loto OM, Makinde ON, Adeyemi AB. Caeserean myomectomy – A safe procedure: A retrospective case-controlled study. Nepal J Obstet Gynaecol 2007;2:59-62. Akbas M, Mihmanli V, Bulut B, Temel Yuksel I, Karahisar G, Demirayak G, et al. Myomectomy for intramural fibroids during caesarean section: A therapeutic dilemma. J Obstet Gynaecol 2017;37:141-5. Schorn MN. Measurement of blood loss: Review of the literature. J Midwifery Womens Health 2010;55:20-7. Tall G, Wise D, Grove P, Wilkinson C. The accuracy of external blood loss estimation by ambulance and hospital personnel. Emerg Med (Fremantle) 2003;15:318-21. Patton K, Funk DL, McErlean M, Bartfield JM. Accuracy of estimation of external blood loss by EMS personnel. J Trauma 2001;50:914-6. Yoong W, Karavolos S, Damodaram M, Madgwick K, Milestone N, Al-Habib A, et al. Observer accuracy and reproducibility of visual estimation of blood loss in obstetrics: How accurate and consistent are health-care professionals? Arch Gynecol Obstet 2010;281:207-13. Adkins AR, Lee D, Woody DJ, White WA Jr. Accuracy of blood loss estimations among anesthesia providers. AANA J 2014;82:300-6. Buckland SS, Homer CS. Estimating blood loss after birth: Using simulated clinical examples. Women Birth 2007;20:85-8. Hébert PC, Wells G, Blajchman MA, Marshall J, Martin C, Pagliarello G, et al. A multicenter, randomized, controlled clinical trial of transfusion requirements in critical care. Transfusion requirements in critical care investigators, Canadian critical care trials group. N Engl J Med 1999;340:409-17. Brown D, Fletcher HM, Myrie MO, Reid M. Caesarean myomectomy – A safe procedure. A retrospective case controlled study. J Obstet Gynaecol 1999;19:139-41. Machado LS, Gowri V, Al-Riyami N, Al-Kharusi L. Caesarean myomectomy: Feasibility and safety. Sultan Qaboos Univ Med J 2012;12:190-6. Sparić R, Malvasi A, Kadija S, Babović I, Nejković L, Tinelli A, et al. Cesarean myomectomy trends and controversies: An appraisal. J Matern Fetal Neonatal Med 2017;30:1114-23. Awoleke J. Review article: Myomectomy during caesarean birth in fibroid endemic low-resource settings. Obstet Gynaecol Int 2013;3: 1-6. [doi: 10.1155/2013/520834].